Meet Redwerk at Tech Open Air in Berlin! 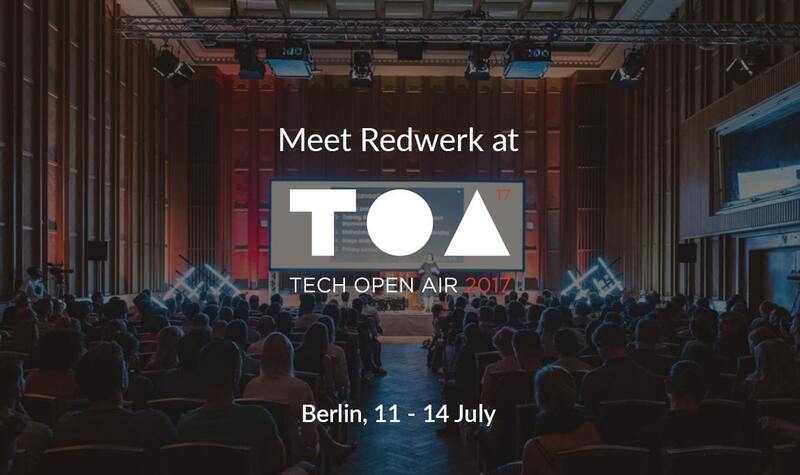 › Blog › Meet Redwerk at Tech Open Air in Berlin! This year Redwerk forged a partnership with one of the biggest European tech events — TOA. Let’s take a closer look at this conference and the opportunities offered to its participants. Tech Open Air (or TOA) first appeared in 2012 as a festival aimed at bringing together such, at first sight, hardly compatible areas as technology, music, science and art. Taking place in Berlin, the festival has one very specific feature: it was the first to be organised through crowdfunding only. According to its founders, TOA is a perfect platform to share your thoughts and pass the knowledge on, no matter who you are: a technological changemaker or an art person. The festival became possible only thanks to the common effort of many people, and community still remains an important part of TOA’s life and philosophy. Apart from the main event, which takes place in Funkhaus Berlin this year, there’s also a massive supporting force made up of various satellite events hosted all around the city. This way TOA participants get the chance to take part in workshops, do yoga, have a couple of refreshing drinks and, of course, learn from the top thought leaders. All the key conference events will take place in Funkhaus Berlin on July 12 and July 13. Besides the usual outdoor area and broadcasting halls, this year will be marked by adding a totally new site: The The Haus of Tech – a 3.000sqm exhibition space with five theme areas dedicated to AR/VR Entertainment, Mobility, Energy/Cleantech, Life Sciences/Social Impact, Data Infrastructure and Fintech. Leading conference events will also include top-notch speakers, some interactive formats and another novelty: the new TOA “Family Affair” format, connecting smaller family-run businesses with startups. More that 30 TOA partners, both national and international ones, confirmed their participation in conference, so it’s definitely going to be something worth attending. Of course, Redwerk couldn’t miss this awesome festival of technology. So, if you happen to be in Berlin on July 12-14, we’re inviting you to visit our cosy booth at TOA. We know that the true festival is not only in the main halls. It’s in communication, meetings and opening up new vistas. We are happy to discuss opportunities to work together. Redwerk is a full cycle software development agency. Since 2005 our we help conceptualize, design, implement, test, and launch software projects for our customers in EU, Canada, and the USA. We create web solutions and apps. For desktop and mobile. For smartphones and tablets. Online and offline. For established businesses and startups. We provide you with the team to fulfill your dream. Whatever you market, Redwerk can help you create valuable software that people will love. We have experience and expertise to provide solutions you require, so don’t miss out on a chance to meet us at booth C25! Planning to attend Tech Open Air in Berlin this July? Redwerk will be happy to meet you there. Contact us and we’ll schedule a talk at our welcoming booth! See you at TOA.